Following the swift sellout of last year’s Zurich Weltzeit Singapore Edition, Nomos has once again rolled out a pair for limited editions for the city state, clad in a combination of blue and salmon. 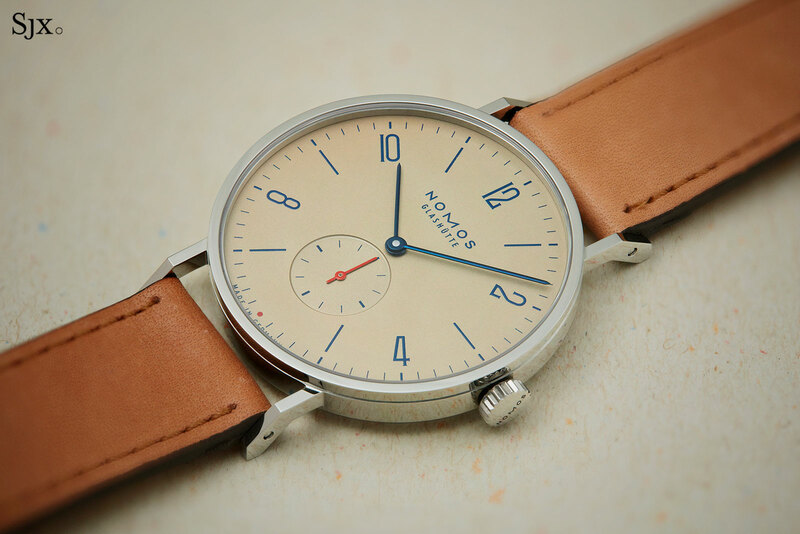 The Tangente was inspired by 1930s wristwatches and designed in Deutscher Werkbund style. Simple in form but nevertheless distinctive, the case is steel, entirely polished, and characterised by flat planes on all surfaces. 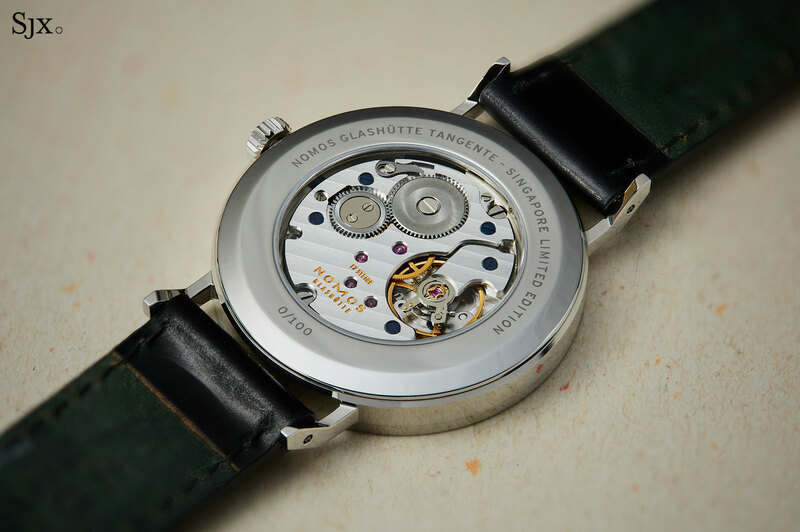 At 37.5mm in diameter and 6.75mm high, the case is elegantly proportioned, with the long lugs giving it a slightly larger footprint than most similarly sized watches. The first dial variant is inspired by the salmon dial of last year’s Zurich world time, though the dial is a slightly more muted, darker shade of the colour. 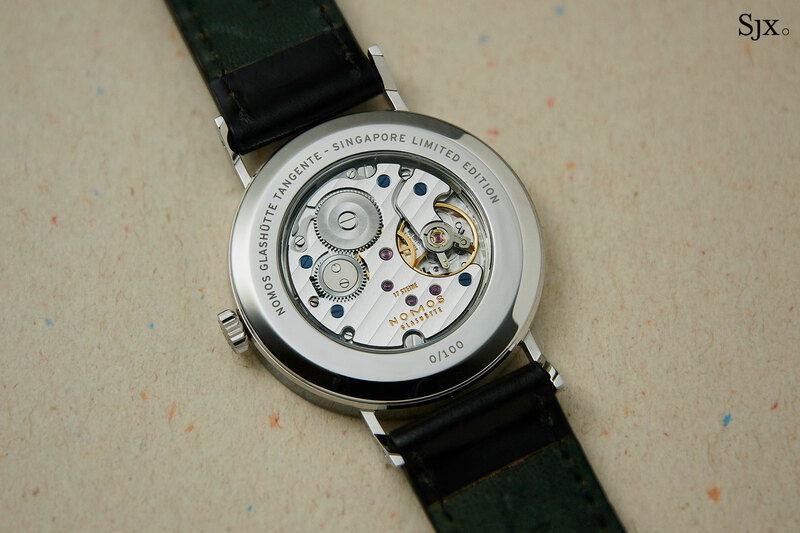 The galvanic salmon finish is matched with dark blue markings on the dial and blued steel hands, along with a red seconds hand and a red dot at six o’clock, a reference to Singapore’s nickname due to the island’s size on a map. 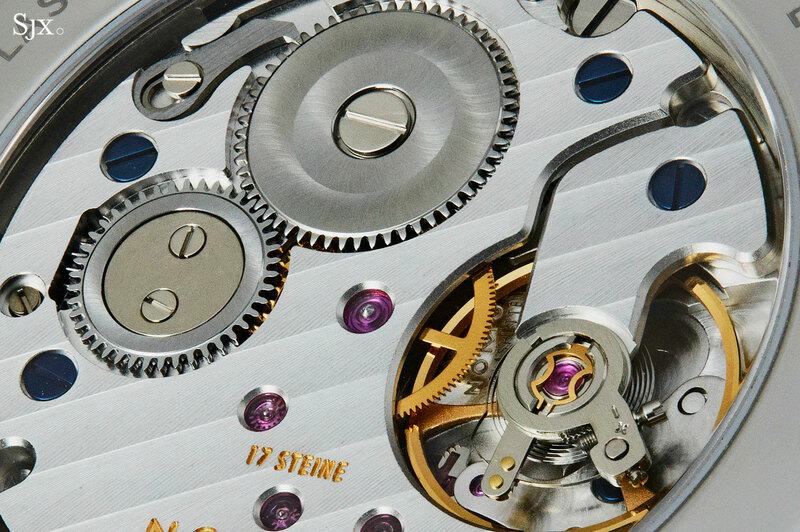 In most light the blue markings on the dial appear black, but the polished, blued steel hands catch the light well. 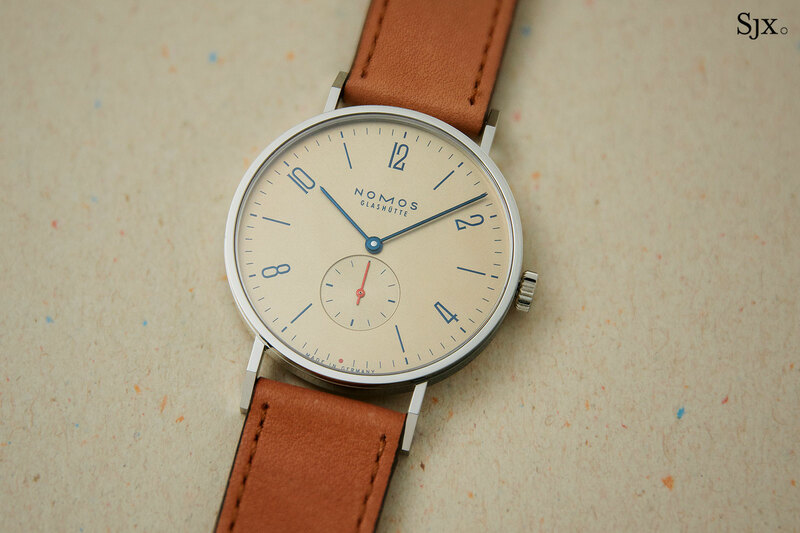 The salmon model is matched with a light tan Horween calfskin strap that matches the dial but offers little contrast. The colours of the dial and strap means the watch tends to blend in with East Asian skin tones, so some might prefer a darker strap. The second version is essentially an inversion of the colours on the first, featuring a blue dial and rose gold markings. 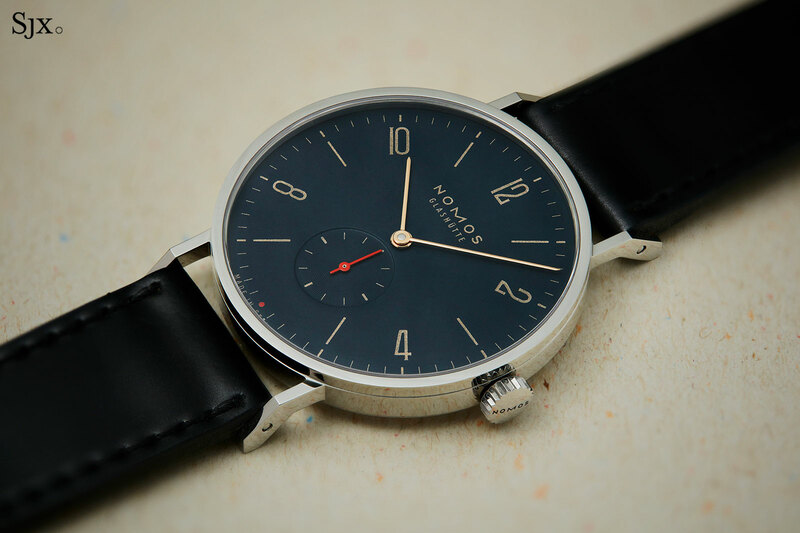 Though the “midnight blue” dial shares the same name with the blue dials found on other Nomos watches, this is a different, darker colour, being a blue that is almost charcoal under most light. It’s paired with copper markings on the dial and rose gold-plated hands, along with a seconds hand and dot at six in red. 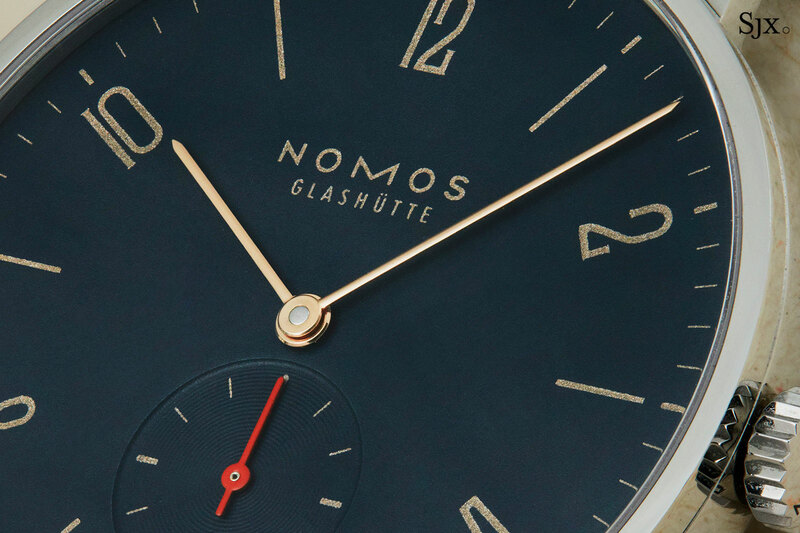 The blue and rose gold colour combination is an unusual one for Nomos, which typically leans towards lighter, cheery colours, often matching dark dials with pastel coloured accents. 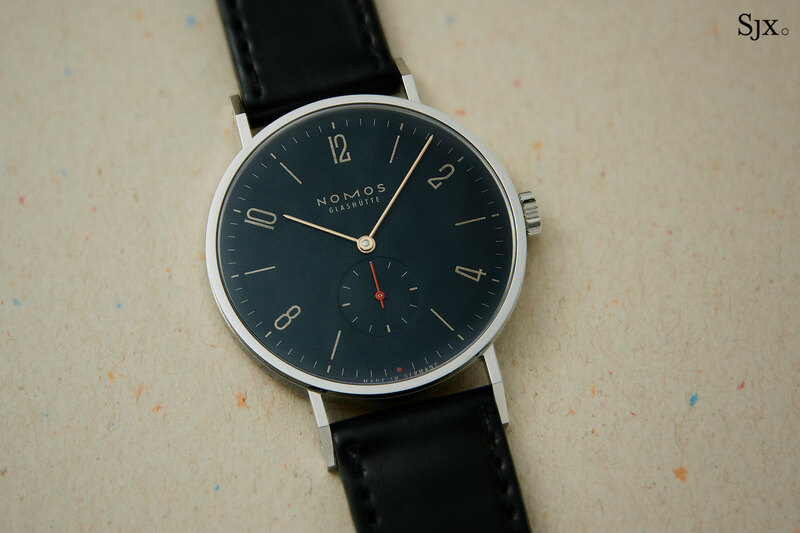 Though different, it is a subtle combination that is slightly more serious and luxe than the average Nomos palette. While the colour is new, the midnight blue model is fitted to the standard, but much loved, Horween shell cordovan strap in black. 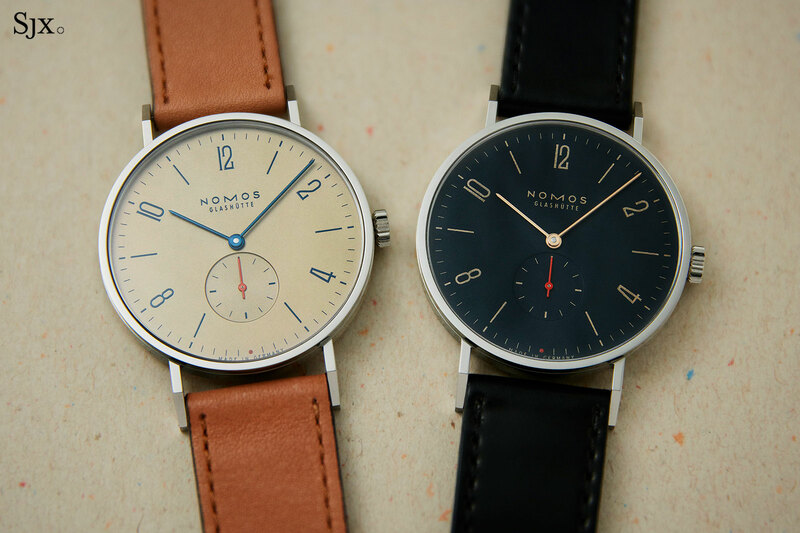 Between the two, the salmon dial will undoubtedly be the first choice for many buyers, but the midnight blue Tangente is arguably the one for anyone who already has a Nomos with a light-coloured dial. Both are equipped with the standard movement for the Tangente 38, the hand-wound Alpha calibre that has 17 jewels and a 43-hour power reserve.. Built with the ETA Peseux 7001 as a base, the Alpha was the first movement developed by Nomos and is now mostly produced in-house by Nomos. A few functional improvements were made to the 7001 architecture, including a redesigned winding click, as well as the addition of a Triovis regulator and hacking seconds. Other changes are decorative, including a three-quarter plate, blued steel screws and spiral graining on the winding wheels. The result is a robust, reliable but unique proprietary movement that offers tremendous value and also appealing aesthetics. The only downside of the movement, albeit a minor one, is its size, which at 10 1/2”’ or 23.3mm is quite a bit smaller than the watch case. That leaves the subsidiary seconds sitting relatively close to the centre of the dial. 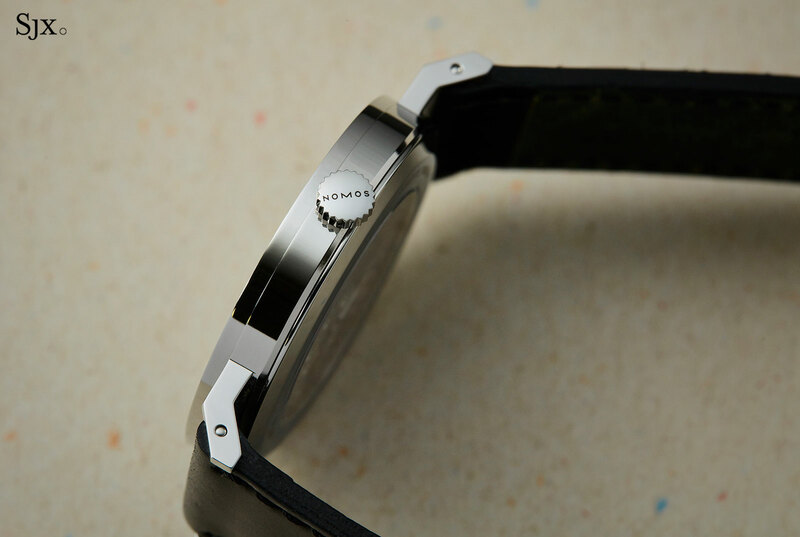 Each version is limited to 100 watches, individually numbered on the case back. The Tangente ‘Red Dot’ is available from The Hour Glass, priced at S$3200 including local taxes, which is the same as the ordinary version of the Tangente 38. That’s equivalent to US$2340, and includes shipping for foreign buyers. 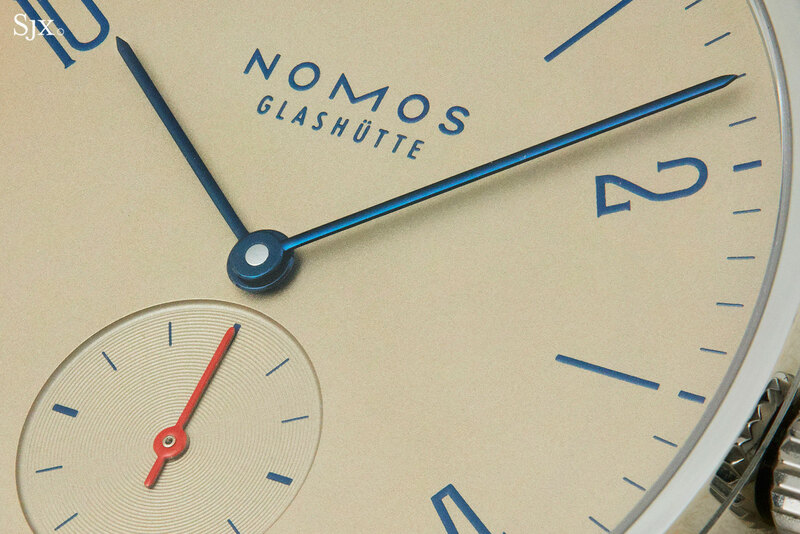 The extra-thin Nomos neomatik is now available in deep, dark blue.